There’s no doubt about it – Australians have become obsessed with MasterChef. The final episode of the recent cooking phenomenon attracted record-breaking ratings, and with it, saw the launch of the first ever TV promo for the newest addition to the franchise: Junior MasterChef. By ‘listening in’ on audiences’ online discussions, a recent study conducted by UniSA’s Ehrenberg-Bass Institute explored how people’s opinions changed as a result of having seen a taster of the Junior version. They found, not only did the launch of the exciting new ad trigger a substantial spike in comments about Junior MasterChef, but also the discussions about the show became significantly more positive after the promo launch. This is good news for Channel Ten, and for other Junior MasterChef stakeholders such as advertisers and sponsors. Using Nielsen’s BuzzMetrics software, the study involved collecting online conversations about the spin-off program, posted between late October 2009 and mid-August 2010. Each electronic post contained the key search terms, ‘Junior MasterChef‘, or slight variations of these terms. Those that were unreadable or deemed irrelevant were excluded. whether it was generally positive, negative or neutral. As some posts contained multiple issues relating to the show (e.g., “The dishes on Junior MasterChef look great. I wonder if it will be aired during prime-time?”), the analysts could identify up to two themes in terms of what each post was about. How much word of mouth? The launch of Junior MasterChef’s promo had an overwhelming effect on the number of comments generated about the TV show. Prior to the first promo, online comments about Junior MasterChef occurred at a fairly steady pace. After the launch of the ad however, the amount of comments escalated. And the increase was truly staggering ¬- more comments had been generated in just the fortnight following the promo launch, than all of the comments posted in the nine months prior. But don’t celebrate too soon – as the amount of buzz quickly tapers off after a few short days. This suggests that the promo itself does not remain incredibly newsworthy for long. Did the launch of the first Junior Masterchef promo change the content of discussions? The researchers on the project also explored whether the nature of online conversations about Junior MasterChef changed following the launch of its first ad. To aid in their understanding of this, they compared the themes that were prominently discussed prior to and post promo launch. Discussions about the existing MasterChef Australia or (another extension of the franchise) were greater after the launch of the Junior MasterChef promo. This was, however, as expected considering the launch of the Junior MasterChef promo coincided with the season finale of MasterChef Australia. Prior to any exposure to a given TV show, audiences are likely to know little about it, and are therefore less able to have an opinion on it. Presumably, program promotions help people form opinions, and develop their own conclusions about a TV show. This was reflected in this study, as more people expressed an opinion, feeling or attitude about Junior MasterChef after having been exposed to the ad. Advertising in general for Junior MasterChef was the most dominant theme within conversations before its first ad was aired. Although, references to the program’s general advertising decreased after the launch of the first ad. Unsurprisingly, people only discussed the Junior MasterChef promo after it first premiered. This suggests that before audiences are exposed to a program’s promotion, they are likely to draw on what they have seen or heard through external advertising in their discussions about a TV show. However, after its launch, the promo is likely to dominate discussions. Further analysis was carried out on those comments about the TV promo specifically, providing insight into which aspect/s of program promotion best stimulated the word of mouth. comments about the dishes shown during the promo (9 comments). All comments about the promo were positive. General comments about the promo: Words used to describe the promo itself, and how the promo portrayed the Junior MasterChef series included: good; crazy; upbeat and exciting; decent; fantastic; very interesting; a treat; pretty good; cute; fun; as good as the original; like great family viewing; and fricken awesome. Comments about the dishes shown in the promo: The dishes shown in the promo, that the junior chefs plated up also stimulated a positive response. These dishes were described within posts as: amazing; complicated; fantastic and like restaurant quality. As well as classifying the content of conversations, each post was also categorised broadly into one of the following groups: Very Positive; Generally Positive; Neutral; Generally Negative; Very Negative or Mixed. 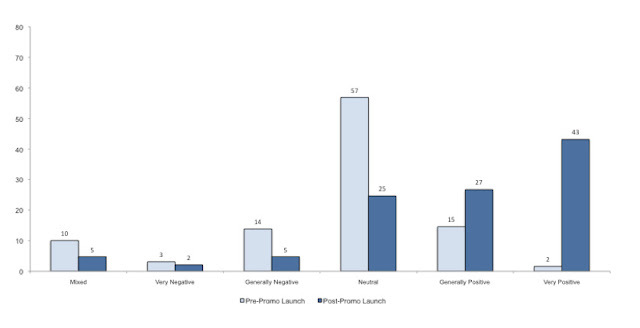 This enabled the researchers to assess the valence distribution of the word of mouth, and examine whether there were any differences prior to and post promo launch. Prior to the launch of the promo, comments about Junior MasterChef were predominantly neutral. After the first promo was shown however, the comments shifted to become much more positive. The overall positive reaction amongst viewers is, no doubt, a palatable outcome for Channel Ten executives and shareholders. 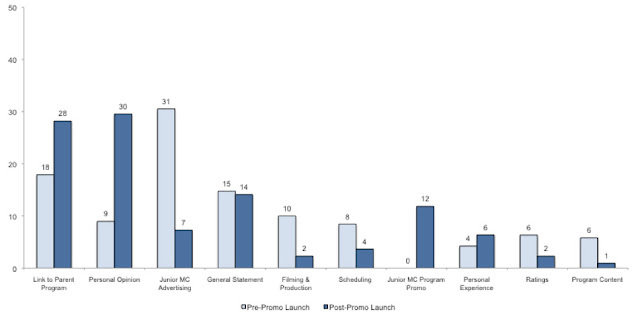 These research findings provided by the Ehrenberg-Bass Institute also show the value that a single program promotion can have on word of mouth, in turn highlighting the importance of TV promos in securing audience tune-in. This study is part of a larger research project, which examines how viewers learn about new television programs, and particularly the role that word of mouth plays in this. The next step will involve investigating how the content of discussions change prior to, and post program launch, and how the word of mouth about new TV programs differs to that of returning programs. An additional component of the research will explore which specific elements within a program promotion are most likely to stimulate conversation.